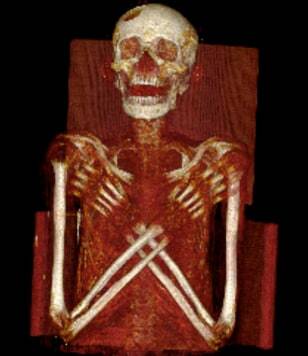 Researchers examined a 2,900-year-old mummy using X-rays, CT and magnetic resonance imaging (MRI) scans. They found that he suffered from Hand-Schuller-Christian’s disease, a very rare condition that left him with lesions in his skull and spine. A large hole on his frontal-parietal bone can be readily seen in this image.